This article is for G Suite super administrators. 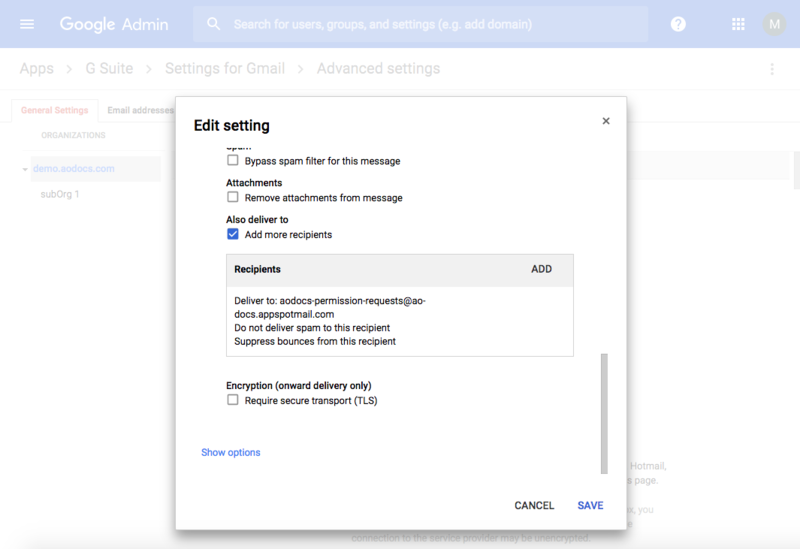 You should use this procedure only if your organization uses Gmail as its email system. If this is not the case, ask your email system administrator to set up forwarding rules of all your storage accounts to the following email address: aodocs-permission-requests@ao-docs.appspotmail.com. Why do you need to set a forwarding rule for the storage account? If you don't implement a forwarding rule, when users make sharing requests on AODocs documents, the requests are sent by email only to the storage account. This is a technical account, so if no one regularly accesses the mailbox of the storage account, the sharing requests won't be received and processed by the appropriate person, and the sharing requests will be lost. 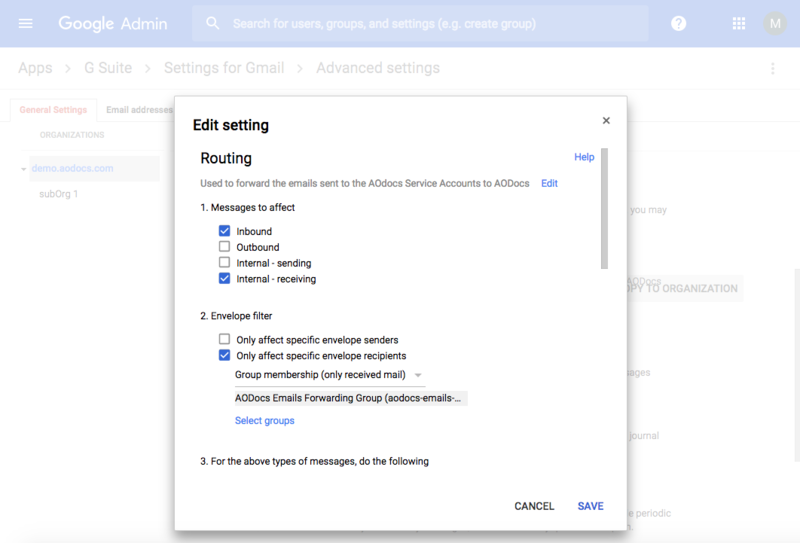 Description: This Google Group is used in the G Suite Control Panel email routing rules to forward all the emails received by the AODocs storage accounts to AODocs Application. 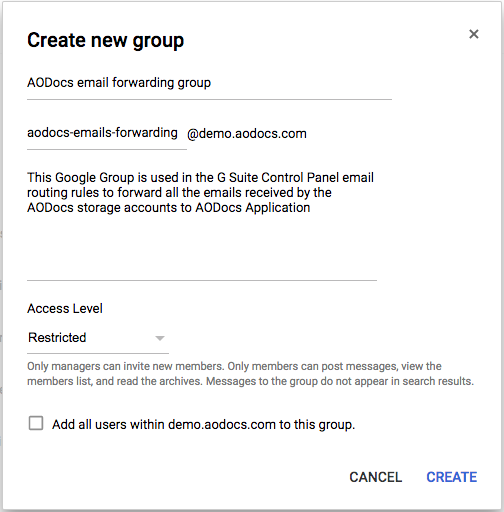 Note: Do not delete this admin group for as long as you use AODocs in G Suite. If you have multiple storage accounts, add them all as members to the newly created group. 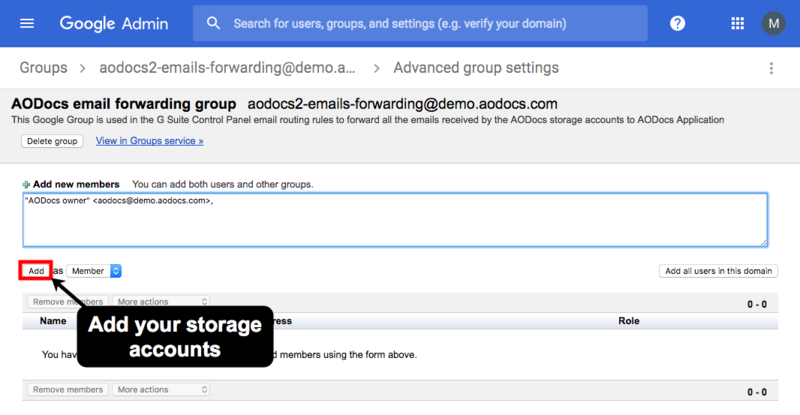 In our example, we are adding the storage account aodocs@demo.aodocs.com to the group aodocs-emails-forwarding@demo.aodocs.com. 1. In admin.google.com, select Apps. 2. Select G Suite, then Gmail. 3. Under Advanced settings, scroll down to Routing. You can also use the search bar. Short description: Used to forward the emails sent to the AODocs Service Accounts to AODocs. Note: If you have more than one organization, set up the routing rule at the root organization. 6. Under For the above types of messages do the following, scroll down and select: Modify message, then Also deliver to: aodocs-permission-requests@ao-docs.appspotmail.com. 6. Save the routing rule.